This ASCD Study Guide is designed to enhance your understanding and application of the information contained in Grading Smarter, Not Harder, an ASCD book written by Myron Dueck and published in July 2014. Most of the questions contained in this study guide are ones you can think about on your own, but you might consider pairing with a colleague or forming a study group with others who have read (or are reading) Grading Smarter, Not Harder. What are you most hoping to learn from this book? To what extent do your assessment practices promote learning? Do your assessment practices promote problem solving and deeper thinking, or do they reward rote memorization? Do the assessment practices in your school or classroom exacerbate the challenges that students in poverty already face? What changes could be implemented to correct this? Consider the four accounts of students in this chapter who were unable to show evidence of learning. Do you consider any of the accounts to serve as a measure of learning? Can you identify times when you use punitive grading to manipulate behavior? Is there an alternative approach you can take to establish or maintain grading accuracy? Do students in your school receive grading penalties for factors that lie outside of their control? Which is more prevalent in your department or school, the 4-point scale or the 100-point scale? Would you reconsider the use of zeros in a 100-point system? Consider the four CARE conditions for punitive action. Which one do you think is most powerful and what steps might you take to make sure that you comply with the four conditions in your classroom? Do the zeros that you hand out represent both missing assignments and assignments in which students fail to demonstrate understanding? If so, how do you tell the difference between the two? Note the number of interventions listed in Figure 1.3. To what extent does your school inform struggling learners of the supports and interventions that are available to them? Do you consider the assessment of uniform homework to be a valuable use of your professional skills? Work ethic, responsibility, and effort are all valuable traits. Does grading homework help these traits to develop in students, or does it reward those who already have them? Can you identify areas of instruction where grades are prone to inflation? Might uniform homework be one of them? If the amount of help that students receive on homework varies from family to family, is it fair to attach scores to individual students for the work? How rampant are student claims of test anxiety in your classroom, and to what extent do you think unsatisfactory homework strategies contribute to them? Is the double-jeopardy argument outlined in this book a fair criticism of the effect that uniform homework can have on the grades of at-risk students? What are the major barriers to homework completion? Could some of these barriers be overcome without the use of grades? Review the array of in-school supports listed in Chapter 2. Which of these would most benefit the students in your school? What would it take to implement to them? Review the four types of targets discussed in this chapter: knowledge, reasoning, skill, and product. Which of these would be most applicable to your classroom assessments? Do you believe that clear learning targets improve learning? Why does the author believe that educators should personalize learning targets for students? Do you think students should observe and analyze the work of other students before embarking on their own work? Designing effective unit plans can be labor intensive. Can you think of any team structures in your school that could facilitate the design process? –Are learning intentions clear in your classroom? –Do you give students clear feedback that reflects the extent to which they met the learning intentions? –Are there effective strategies and opportunities in place at your school to let students exercise focused revision of missed learning intentions? Prioritize the above questions according to how much they apply to your classroom. What is one strategy you could employ to address the most pressing of the three questions? How might your department respond to students who clearly are not ready for a major assessment? Does your school celebrate mastery learning? If so, what specific structures and routines are in place to do so? List a few supports that you might suggest or even require that students experience prior to taking a retest. To what extent are your students grade-focused compared to learning-focused? What is one thing you could do to try start shifting this ratio? Do you use testing data as formative assessments of your own teaching? If so, what do you do if a particular concept appears to have been misunderstood by a large section of the class? How specific and useful is the feedback that you provide for parents at parent-teacher meetings? In your classroom, is failure seen as a natural step in the learning process? Debate the following question: Should homework completion always be a prerequisite for retesting? Consider points for and against this argument. Do you see students in your classroom who exhibit an oppositional stance toward schooling? If so, what strategies might you use to address this? Can you recall a time when a creative pursuit in the classroom ended in frustration for you or the students? Did this affect your desire to reintroduced creative activities? Is there a disparity between rich and poor kids in your school when it comes to access to creative activities? What could you do to narrow this gap? How might the Project Planning Sheet help students stay focused on essential learning outcomes while engaged in creative activities? Do your students have a green light to blend their own personal interests with classroom projects? Is project-based learning alive and well in your classroom? If so, would you say that it's geared towards uniformity or individuality? Think of times when classroom disruptions and misbehaviors were few and far between. Were you engaged in creative lessons at the time? Is your school the main source of positive adult role models and mentorship programs in the community? What policies and supports exist in your school to counteract the negative living conditions of certain students? Individually or in a group, discuss reasons for and against group scores on projects. Do you believe that good relationships are central to effective teaching? What do you most believe is critical to creating a great school? Is it possible for a policy to align with all of your beliefs? 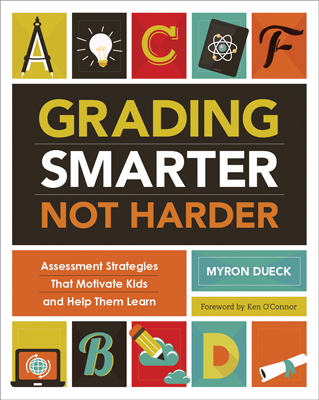 Grading Smarter, Not Harder: Assessment Strategies That Motivate Kids and Help Them Learn was written by Myron Dueck. This 180-page, 6" x 9" book (Stock # 114003; ISBN-13: 978-1-4166-1890-4) is available from ASCD for $21.95 (ASCD member) or $28.95 (nonmember). Copyright © 2014 by ASCD. To order a copy, call ASCD at 1-800-933-2723 (in Virginia 1-703-578-9600) and press 2 for the Service Center. Or buy the book from ASCD's Online Store. Copyright © 2014 by ASCD. All rights reserved. No part of this publication—including the drawings, graphs, illustrations, or chapters, except for brief quotations in critical reviews or articles—may be reproduced or transmitted in any form or by any means, electronic or mechanical, including photocopy, recording, or any information storage and retrieval system, without permission from ASCD.